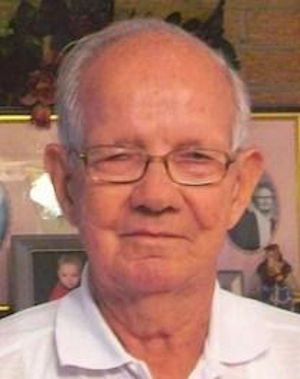 Obituary – Henry, Ronald Keith « Perry High School Alumni Association, Inc.
Ronald Keith Henry, 86, beloved husband, father, grandfather, and great grandfather passed away on February 13, 2012 at his residence. He died peacefully in his sleep after a long and courageous battle with cancer. He was born August 5, 1925 to Irl and Verla Eone Oden Henry in Watchorn, OK.
Ronald attended and graduated from Perry High School where he participated in many sports. His favorite sport was baseball and as a young man he played semi-pro baseball. He also enjoyed fishing, golf, the Yankees and OU and Mojo football. Ronald married the love of his life, Ethmer Mae Stotts, on July 8, 1950. He adored and cherished her until the day he died and their 61 years of love and devotion was an inspiration to all. He was employed by Armco National Supply for 30 years where he formed many lifelong friendships. He was preceded in death by brothers; Irl Wayne Henry, Edward Glen Henry, Donald Ray Henry, Bobby Loraine Henry, sister; Verla June Connelly. He is survived by wife; Ethmer Mae Stotts Henry, daughter; Carla Wells of Odessa, son; Keith Henry of Riviera Beach, FL., grandchildren; Christopher Henry, Wes Wells and wife Kina, great-grandchildren; Parker Wells and BrookeLynn Wells, sister; Carmalita Austin of Mansfield, OH., as well as many nieces and nephews. Funeral service will be 10:00 a.m. Thursday, February 16, 2012 at Sherwood Baptist Church. Burial will be 2:00 p.m. Friday, February 17, 2012 in Perry, OK.
Memorials may be made to Home Hospice 516 N. Texas, of Odessa or Sherwood Baptist Church.